2009 2010. VStar prototype for 1 st Citizen Sky workshop. 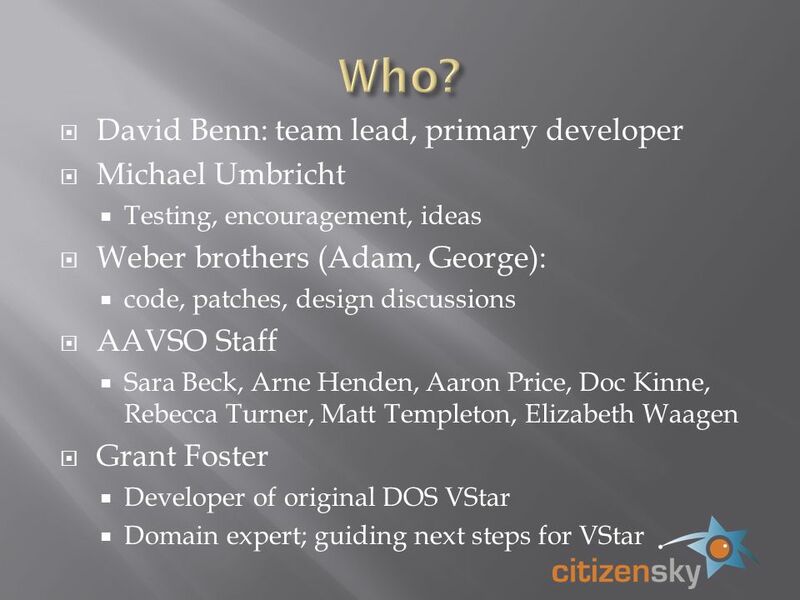 3 months of spare time development from May 2009 collaboration with AAVSO staff first Citizen. 2 VStar prototype for 1 st Citizen Sky workshop. 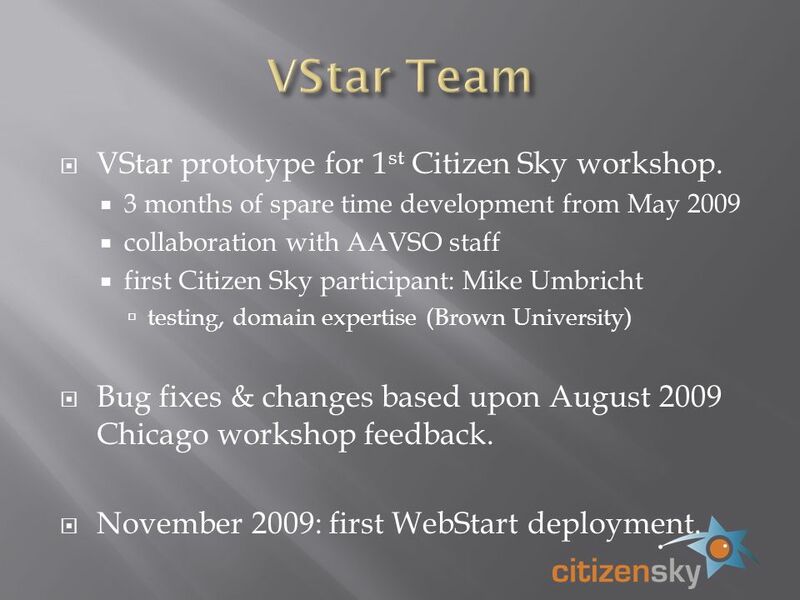 3 months of spare time development from May 2009 collaboration with AAVSO staff first Citizen Sky participant: Mike Umbricht testing, domain expertise (Brown University) Bug fixes & changes based upon August 2009 Chicago workshop feedback. November 2009: first WebStart deployment. 3 Phase 1 feature set release based on initial requirements from AAVSO. 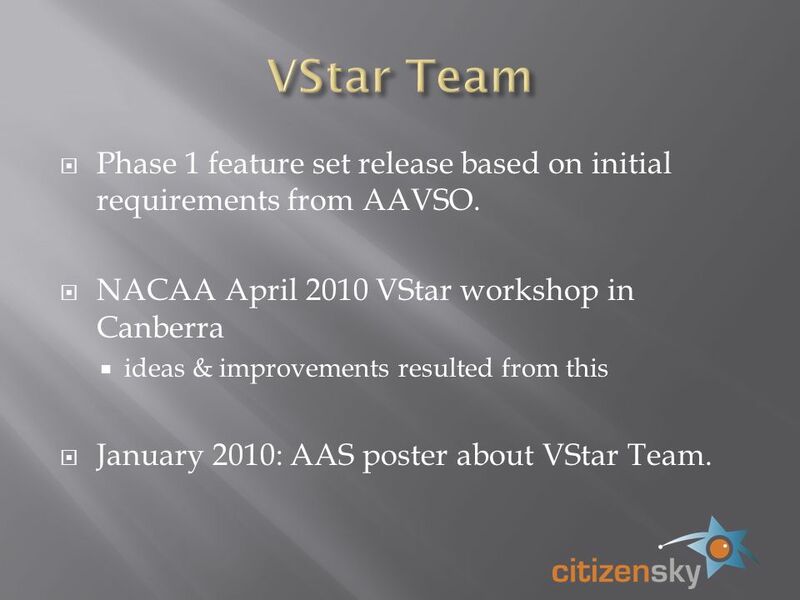 NACAA April 2010 VStar workshop in Canberra ideas & improvements resulted from this January 2010: AAS poster about VStar Team. 5 Numerous others with good intentions sometimes, understandably, having a life prevents you from doing everything you might want to do. VStar was used to plot light curves in Australian S&T article by Alan Plummer (at NACAA workshop, Southern Gems member). 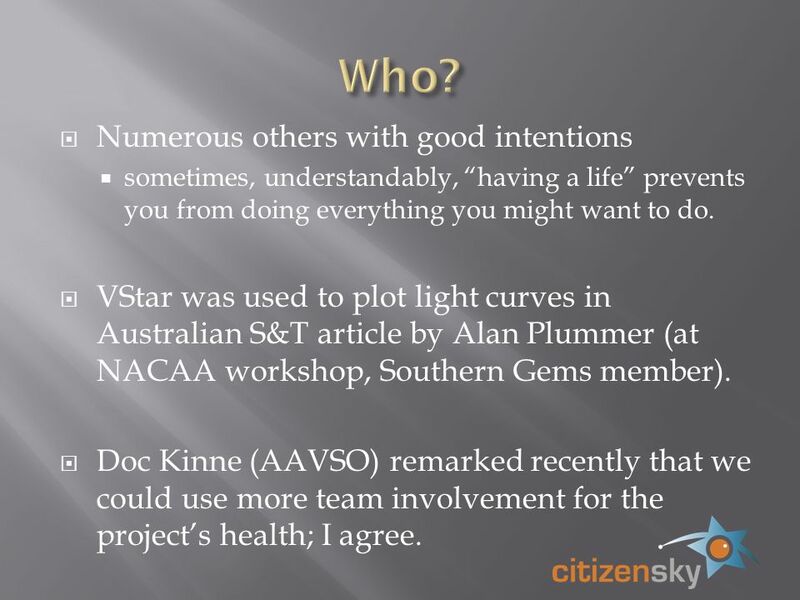 Doc Kinne (AAVSO) remarked recently that we could use more team involvement for the projects health; I agree. 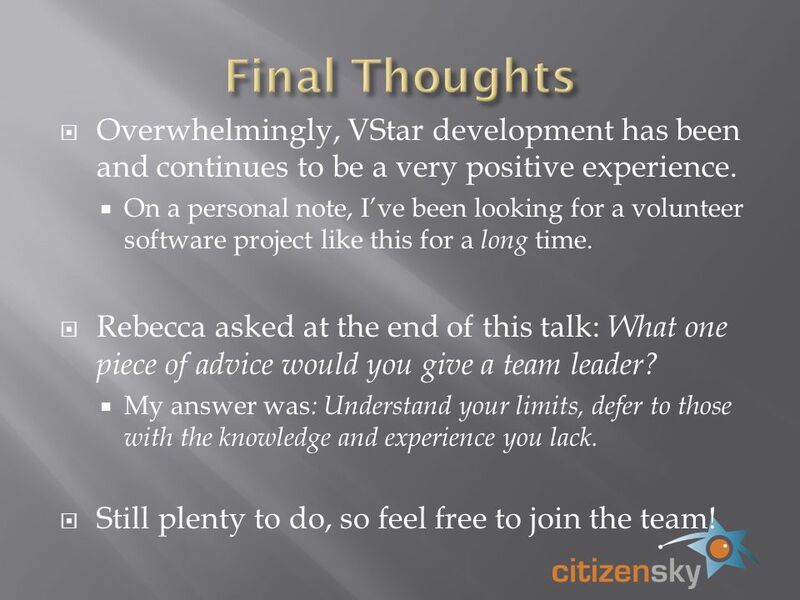 6 Overwhelmingly, VStar development has been and continues to be a very positive experience. On a personal note, Ive been looking for a volunteer software project like this for a long time. Rebecca asked at the end of this talk: What one piece of advice would you give a team leader? My answer was : Understand your limits, defer to those with the knowledge and experience you lack. Still plenty to do, so feel free to join the team! Download ppt "2009 2010. 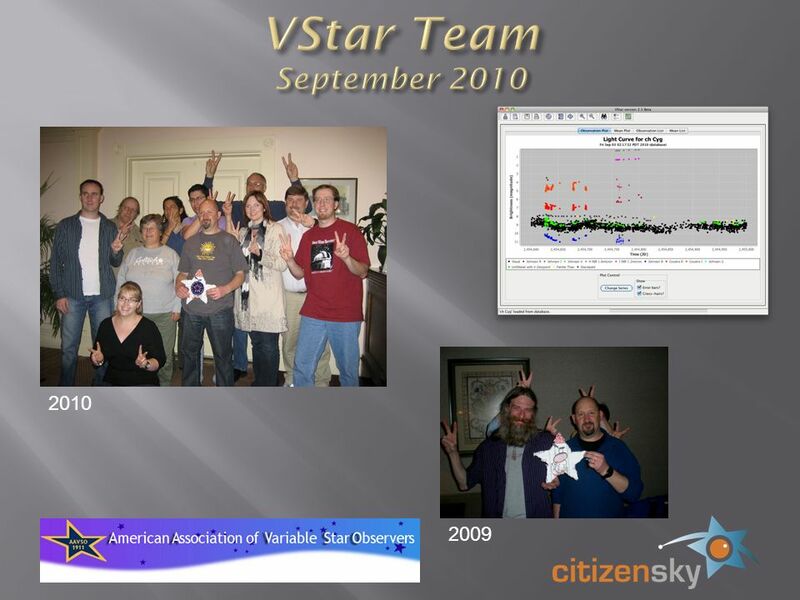 VStar prototype for 1 st Citizen Sky workshop. 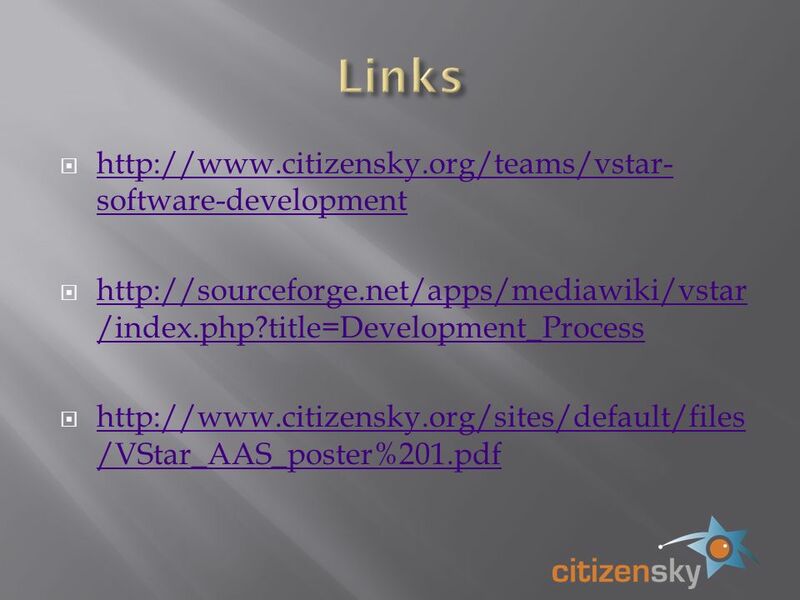 3 months of spare time development from May 2009 collaboration with AAVSO staff first Citizen." Intended to be an easy-to-use variable star data visualization and analysis tool. A SourceForge project licensed under GPL. Downloadable via VStar Team. What is Citizen Sky? 3-year citizen science project organized by the AAVSO focusing on the variable star, epsilon Aurigae. Presented by Sara Beck with help from Doug Welch & David Benn 99th AAVSO Annual Meeting October 29, 2010. 4th Workshop – Belgrade, 12 th April 2011 – Quality Standards in ICT Education CLICK TO EUROPE 4th Workshop – 12 th April Quality Standards in ICT. Michael Oldenkamp Director of Technology and Information Services. MHealth HL7 WG December 2012 Education & Communication (MH EDU-COM) SubGroup. April 2009  Successful  Fragmented  Not much communication  No cross contamination  Not much mentoring. The Muskoka Foundation Volunteer Handbook Part One Dear Traveler, We here “at” Muskoka are excited that you are interested in connecting to our communities. Arizona Library Association ConferenceNovember 14, 2013 Yes, You Can Help People with Legal Questions! Barbara Howe and Janet Fisher, State Library of. Welcome to Facebook. Texas State University October 17, 2006. OPeNDAP Development and Security Policies. Development Policies All of our software uses LGPL or GPL –LGPL is used by most of the code –We want it to.